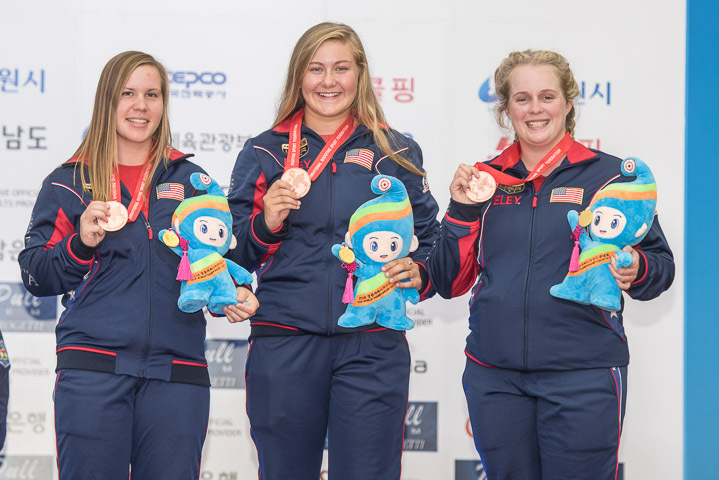 In the first two shotgun events of the 2018 World Championships, the USA picked up two team medals in Junior Women’s Trap and Men’s Trap. Team medals are based on the combined scores of all three of a countries shooters in each event. The first medal went to the Junior Women’s team of Emma Williams, Carey Garrison, and Maddy Bernau. Emma finished with a 113/125, placing her just 3 targets outside of the finals, while Carey finished with a 112/125 to end up just 4 targets out in her first international appearance. Maddy, who was also in her first international appearance, finished with a 101/125. This gave the team a combined score of 326 and was good enough to give them the Bronze Medal! Our second medal went to the Men’s Trap team of Glenn Eller, Grayson Davey, and Jake Wallace. Glenn found himself in the finals wearing bib #1 after shooting a 123/125 and beating two-time World Champion Erik Varga from Slovakia in a shoot-off. Varga had also shot a 123/125 during qualification, but dropped his third target in the shoot-off to give Glenn the #1 bib. Unfortunately, Glenn was the first person eliminated in the finals with a score of 17/25. Grayson, who’s first international competition was the World Cup in Guadalajara earlier this year, posted a 120/125, landing him just two targets back from a shoot-off for the finals. Jake’s sixth appearance in the World Championships ended with a 117/125. 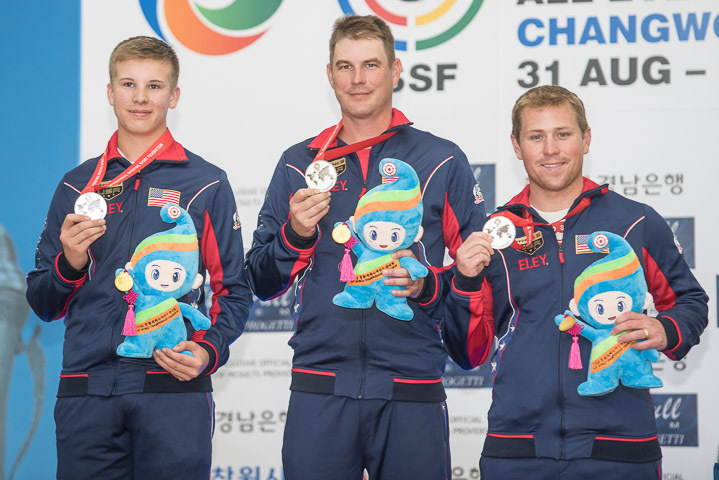 This gave the United States a team score of 360 and a Silver Medal, the first for the American Men in the World Championships since the 2006 team of Brett Erickson, Matt Wallace, and Lance Bade also brought home bronze. The next events for the USA Shotgun Team kick off on Wednesday with the qualification rounds for Junior Men’s Trap and Women’s Trap, followed by finals on Thursday. Check out our Viewing Guide to the 2018 ISSF World Championships for dates and times of finals, as well as links when they come available.